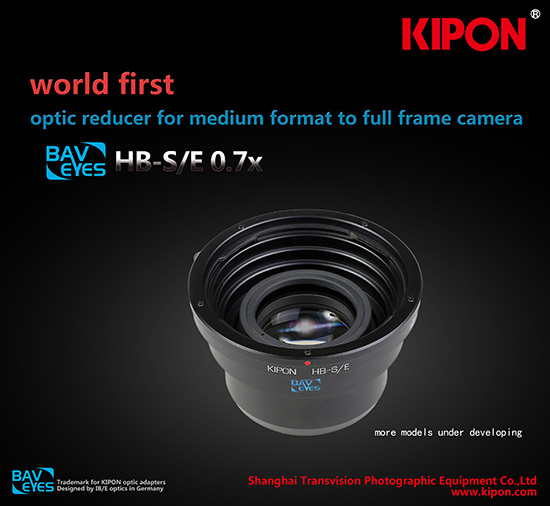 After KIPON released 5 new Handevision models IBERIT full frame lenses with German IB/E Optics, today we release the world's first optic reducer to use medium format lens on full frame cameras and get rid of the crop factor and increase the aperture at the same time. IB/E Optics worked on the optical design for this adapter. The first model Baveyes HB-S/E 0.7x (Baveyes Hasselbld-SONY E 0.7x). is expected to go on sale in early February. Retail price is 415USD. More Baveyes for using medium format lenses on full frame cameras are under developing now.